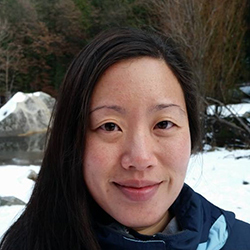 Lisa Chuang specializes in teaching and researching in the areas of intercultural communication, social media, research methods and music as rhetoric. Lisa’s research and teaching philosophy has largely been shaped by her experience as a Peace Corps Volunteer in Northern Thailand (2007-2009), where she served as a teacher to an indigenous marginalized group of ethnically Karen students. It was here that she realized the importance of education and its ability to give people agency. Agency has informed the strategies and teaching methods that she uses in the classrooms, where students are actively involved in identifying key issues and applying theories and concepts learned to their own personal experience/immediate environment and take an active role in making positive changes in their communities. Lisa’s research areas are diverse and range from publications in intercultural interaction on social media and motivational factors of Reddit users to music as rhetoric and examination of Korean drama consumption in the U.S. They have been published in Communication Studies and International Journal of Intercultural Relations and presented at conferences for the International Communication Association (ICA) and Hawai‘i International Conference on System Sciences (HICSS). Currently, her research focuses on developing a better measure of Intercultural Communication Competence (ICC) (especially for online environments). This focus stems from her dissertation research which examined factors (social cue affordances; ICC) that influence the effectiveness of online intercultural interaction via social media channels and involved connecting two classrooms from Thailand and the U.S. via Facebook. Outside of teaching and research, Lisa enjoys singing with the HPU International Chorale and spending time with her husband, Ben Fairfield and son, Sidney.